Homework is the source of great angst between parents and children. Take the example of John, 8, and Mom (names changed to protect the real people). Well, then, what happens at home? We parents get snared in the complex web of parent-child emotions, power sharing, and time management. Here are suggestions to give your children the opportunity to learn responsibility through trial and error, free parents from this onerous task, and free up time and energy for positive parent-child time. Q: Whose problem is homework? A: The child is responsible for homework. The hare-brained schools that assign homework to children younger than third grade assign parents homework, setting up the bad habit of making homework a parent’s problem. Unfortunately, until your child is in third grade, parents must share the responsibility. 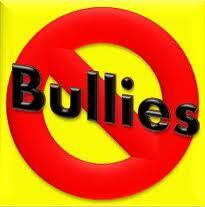 From third grade and up, schools have excellent structures in place for miscreants and parents can step back. Q: How do parents encourage children to do homework? You get the idea. Talk about it. LISTEN to their suggestions. Decide on a plan. Implement the plan for at least a week, to show you respect them, take them seriously and expect them to take on homework as their problem. Expect three weeks to learn the new habit. You are now promoted to “consultant,” not a parent, homework cop or nag. Q: How to follow through? A: You must allow time for children to learn new habits, for them to realize that you are serious, not just “trying” something new. YOU MUST BE PREPARED to allow them to fail. To ignore their decisions that might cause them to miss a homework assignment. Schools have built-in structures for students who do not complete homework assignments. Allow your child to make decisions about when and where to do homework, or not, and allow him/her to feel the cause and effect of his/her decisions. Q: How can I allow my child to fail to turn in homework? A: Perhaps you’re reading this blog in desperation, exhausted from struggling with homework every day. Let it go. Think of the valuable lessons you have learned through mistakes and failure. Do not deny your child this opportunity to learn cause and effect. Keep reading, unless you want to continue to go crazy by forcing kids to do homework on your terms. Q: How do I motivate my children to do homework, without nagging? A: Daniel Pink, author of “Drive: the surprising truth behind what motivates us,” says humans are motivated by three things: Mastery, autonomy and purpose. Notice what’s not in the top three: money, recess, good grades, or pleasing parents. Money, according to Pink, is the lowest form of motivation. Mastery means to feel good about doing something. Autonomy translates to freedom. Purpose means that there’s a reason to do something, which could be to avoid punishment. True motivation comes from within. It’s your job to nurture it through mastery, autonomy and purpose. Q: What will other parents and teachers think and feel about me? A: Most other parents will be jealous that you’re no longer going crazy over homework every day, and that you can use the time and energy to connect with your child in a positive way. Teachers will understand, especially if you privately mention your new stance. Ask him/her for support for a few weeks until your child learns the new habit of taking responsibility and choosing when and where to do homework. Teachers and parents can recognize school projects completed by parents, not children. Your kids’ efforts will be more realistic and rough around the edges. They can feel the mastery, autonomy and purpose from doing projects independently. Q: Am I totally absolved from my kids’ homework? A: No. You are a consultant. You will ask questions, provide encouragement, and guide them to make good decisions. If your child does not complete a homework assignment and gets punished at school, do not inflict additional punishment at home. Let him/her handle school, where experts know what children are capable of. I like to share with parents a list of famous high school dropouts. School isn’t for everyone. There are alternatives, like the General Equivalency Diploma, home schooling, charter schools and community college for older teens. Academic success is a child’s choice, not a parents’ demand. Unless you want them to work for your praise. Remember that childhood is a process of letting go, of transferring power and responsibility from your side of the seesaw, when you do everything, to the child’s side of the seesaw, when they take over responsibility and power for their lives. Homework is an excellent example of a safe place they can experiment with power, success, failure, mastery, autonomy and purpose. They can take on this responsibility. See more in my book, “Raising Able: How chores empower families” [available on Amazon in print and Kindle] on family meetings and encouragement, the most potent ways to foster everything you want your child to do and become in life, and establish a positive lifelong connection. That's me, about to take a swing on the rope swing. 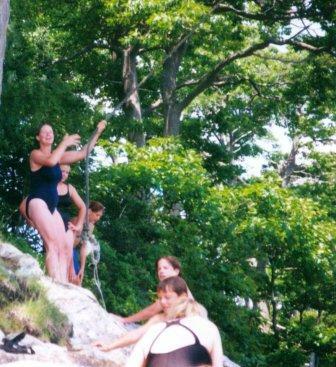 I want to jump back into this picture when we found this rope swing while on vacation with another family on Bustin’s Island in Maine. It was better than an amusement park, closer and cheaper, too. We made our own fun together. Bustin’s Island is an 80-acre island off the coast of Freeport, Maine — no cars allowed. Everything must be hand-carried or put into one of the few pickup trucks that meets the small ferry and taken to rustic cottages. When we went there in the 1990s, most cottages had outhouses, gas lights and gas refrigerators. It was one step above camping and we loved it. The kids and dog could roam free. We found non-electronic things to do like this rope swing, canoeing, playing volleyball, picking blackberries and biking. Getting outside and playing together is one of the best methods for family connection and a mental health remedy. It can be as simple as slowing down for backyard fun, a walk in the neighborhood park, taking a day trip, or going camping. Nature is therapeutic according to multiple studies. Nature is a conduit for family connection — one of the best ways to protect your kids against making bad decisions as they become tweens and teens. A strong parent-child/tween/teen connection is the BEST insurance that they stay away from the bad list — you know that list of parental angst that only grows as they grow up. Find some time to get in your backyard, bike around the block or plant a few seeds. Your kids will remember these activities for a long time. It’s an investment in positive parenting because you can act like a kid and have fun with them. 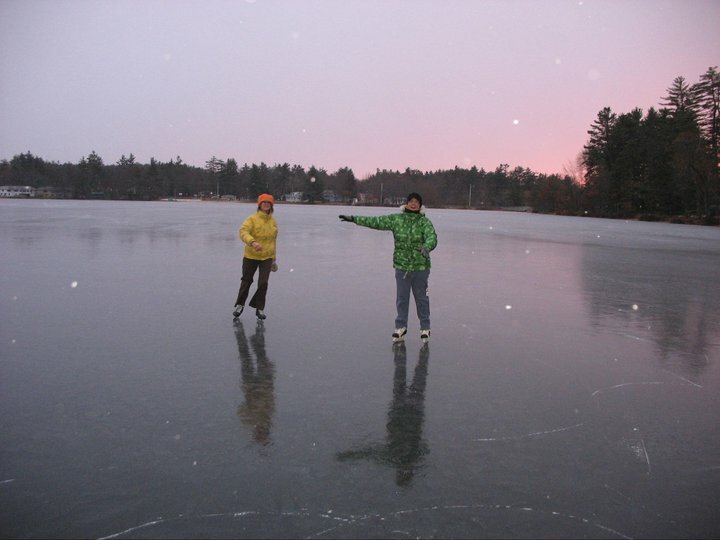 Have a family meeting and make a list of simple outdoor activities your kids want to do this summer. Let loose and take a turn on the rope swing. Bring the camera. Time passes fast. 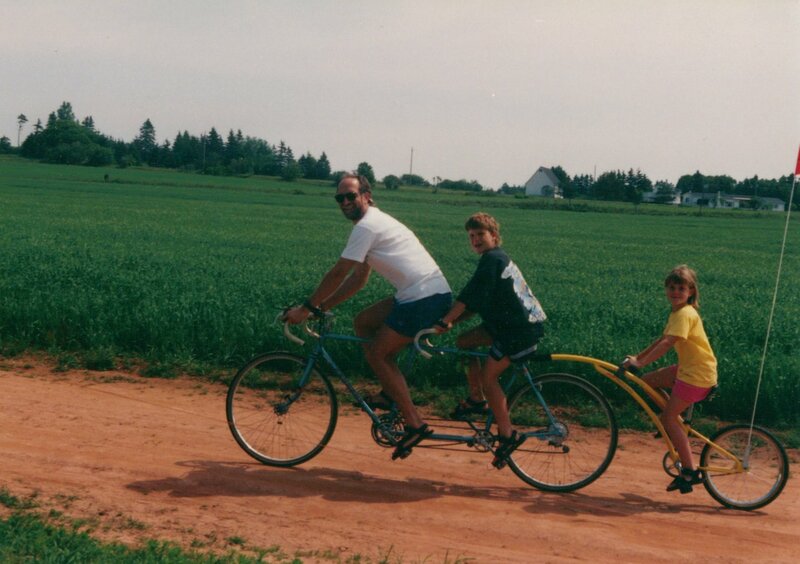 Dad on the tandem with Ian and Kristen in the last century. Lily, the puppy on the left, always wants to play. The older two dogs don't always want to, so they ignore her. Like children, these dogs often fight to establish a hierarchy. Let them! I’m taking care of two extra dogs this week. In addition to the extra dog hair, licking, and exuberance when the front door opens, the dogs show the rules of the kingdom are also useful for children and families. 1. Someone must be boss. The boss must be bossy enough to prove it. As in sports, there is a home court advantage and size matters. 2. Turf is important. Don’t take what isn’t yours. My dog, Gonzo, likes nothing better than to go into Lily’s crate, just to annoy her. 3. Relationships are important. Be aware of who belongs to who. Gonzo is so insecure that she can’t tolerate it when I show affection to Lily or Kasha. 4. Jealousy erupts over turf and relationships. It’s difficult to manage one’s emotions over limited resources. Gonzo growls, intimidates and playfully bites to communicate dominion over turf and relationships. 5. The dogs can work it out. Or not. We adopted Gonzo when she was 2 years old, so she has intrinsic insecurity. She grudgingly shares her resources with others, and complains while doing it, no matter what I do. The dogs prove that it’s best for children and dogs to be allowed to work out their conflicts over turf, relationships and jealousy without interference from authority figures. 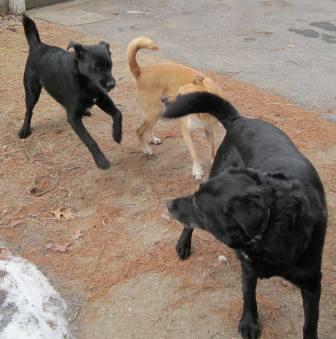 The dogs show that some conflicts can never be resolved, even when Mom and Dad intervene. 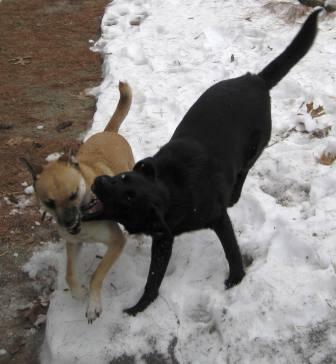 It is best to let dogs/children/teens establish their own hierarchy, define their turf, manage their emotions over jealousy – even when growling, intimidation and physical altercations are involved. They will find out that life isn’t fair and how to manage conflict without a referee. According to research presented on NPR this morning: “The teens who were being raised by so-called indulgent parents who tend to give their children lots of praise and warmth — but offer little in the way of consequences or monitoring of bad behavior — were among the biggest abusers of alcohol. “They were about three times more likely to participate in heavy drinking,” says Stephen Bahr, Ph.D., author of a study of 5,000 teens on drinking. “The same was true for kids whose parents were so strict that no decision was left to the teenager’s own judgment. The key is to develop good decision-making in children from ages 2 to 12, so when they become teenagers and they are 60 miles away going 60 miles an hour, they will choose wisely. Cultivating good decision-making starts when children are young and they experience consequences that follow the Three Rs — related, reasonable and respectful. Thanks to Jane Nelsen, Ph.D. for the Three Rs of natural and logical consequences. For example, when a youngster misbehaves in a restaurant, when Dad says, “Stop or there’s no X-Box for a month,” it does not inspire the child to make an informed decision because it is not respectful, reasonable or related. A consequence that meets the three Rs would be for Dad to say, “Behave yourself or we leave the restaurant now.” Then they leave the restaurant. It’s requires less talking and more action. Parents who sign up for my workshops fall in one of the two extremes described above. They set too many limits or too few limits. Democratic parenting allows for power-sharing and for children to learn to make good decisions by experiencing the natural and logical consequences of them. It takes time, training and thinking. Parents just have to be slightly smarter than the teens and tweens and children, and have a plan.